You drive your car every day, isn’t it nice to know how does it work? 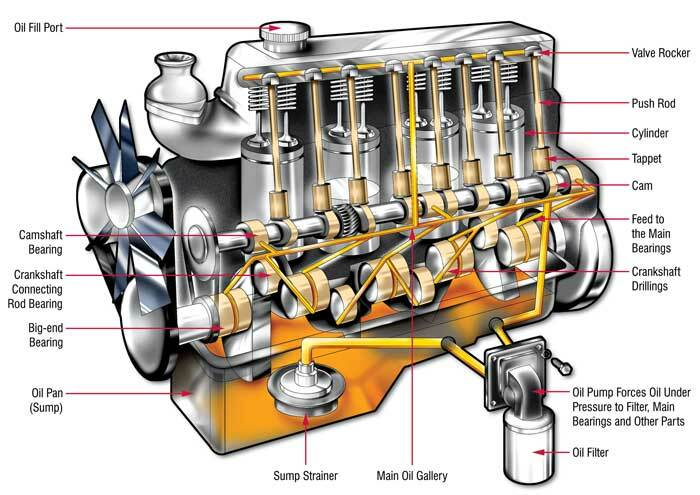 There are the relevant details of how the combustion engine works. You may know about maintaining your car that is you have to change the Engine lubrication oils time to time. What you may not know is where the oil goes, what does it do? and why it needs to be changed time to time? The first task of oil in the engine is to keep the things oily so they could not get dry. Just think for a while if the eardrum-piercing sounds of metal pistons screeching up and down inside a dry cylinder. It will be so annoying, isn’t it? There are pleasant effects of keeping the engine lubricated with automotive lubricants. There is little friction, which makes a sense that engine has to make little effort to keep it running. So, it means that it is able to skate on less fuel can run at the lower temperature. And this means that less wear and tear on the engine parts. Engine needs to fill with clean oil so it can perform well. Never get fooled by the term “lubrication”, sometimes when you go to the local quick lube work shop, they recommend you are supposed to have a “lube job”. That is certainly not an oil change. That absolutely means oiling the chassis and suspension system. None of them shares the oil with lubrication system in engine. The Engine lubrication system is considered to give a flow to the clean oil at the accurate temperature, with a appropriate pressure to each part of the engine. The oil is sucked out into the pump from the sump, as a heart of the system, than forced between the oil filter and pressure is fed to the main bearings and also to the oil pressure gauge. The oil passes through the main bearings feed- holes into the drilled passages which is in the crankshaft and on to the bearings of the connecting rod. The bearings of the piston-pin and cylinder walls get lubricated oil which dispersed by the rotating crankshaft. By the lower ring in the piston the excess being scraped. Each camshaft bearing is fed by the main supply passage from a branch or tributary. And there is another branch which supplies the gears or timing chain on the drive of camshaft. The oil which is excesses then drains back to the sump, where the heat is being transferred to the surrounding air. If the crankshaft journals get worn, the engine will be having very low oil pressure and will throw oil all over inside the engine. The unnecessary splash will overcome the rings and can cause the engine to use that oil. Simply replacing the bearing inserts can restore the worn bearing surfaces. In well maintained engine, bearing wear take places instantly after a cold start because there is less or no oil film between the shaft and bearing. At the time that enough automotive lubricants is dispersed through the hydrodynamic lubrication system apparent and stops the bearing wear progress. A sliding seal avoiding leakage of the air mixture or fuel is provided by piston rings. It gets weaken into the oil sump while combustion and compression from the combustion chamber. On other hand, from leaking into the combustion area they keep oil in the sump, where it will be burned and lost. Those cars that burn oil and have to be added, a quart at every 1,500 miles are flaming it because the rings get no longer to be sealed properly. Hydrodynamic lubrication prevails in the center of the cylinder wall and the piston rings of the good maintained car, essential for the very lower wear and friction. The thickness of the film becomes assorted and minimal lubrication may exist where the piston will stop to redirect on the top and bottom of the dead centre. To analyze or realize well head transfer from the piston to the cylinder, a finest sealing, a minimal thickness of film and a minimum of oil burning is desirable. Oil controlling ring keeps minimal the thickness of film. This is ring is located after the piston rings so that the surplus oil directly scraped down to the sump. To lubricate the following ring the oil film left on the cylinder wall by the passage of this ring will be available. Oil degradation results by the air mixture or leakage of the fuel which exhaust from the combustion chamber into the oil sump. That is why, frequent replenish of oil despites, oil change will remain essential or it can also become more essential. Picture, engine lubricating scheme: Machinery Lubrication Magazine. For more details. Please visit our website: www.lubrita.com - Industrial Oils manufacturer.